There’s that exact moment in time when the music sombres and Emraan Hashmi’s face contorts into a grim expression of moral awakening. We remember it best from Awarapan — perhaps the most enduring flick of the old-Emraan era — when his gangster character was moved to rebellion for a girl held captive by mobsters. In Dibakar Banerjee’s Shanghai, he played Joginder Parmar, a sleazy streetwise photographer who is rattled by the killing of a land activist, and the related silencing of his caregiving uncle. A more recent example can be found in Danis Tanovic’s Tigers, where Emraan’s character Ayan — a gifted sales rep working for a global pharmaceutical company in Pakistan — is pointed to the deaths of hundreds of babies, caused by the very product of his peddling. Quite surprisingly though, in Soumik Sen’s Why Cheat India, that moment never comes. 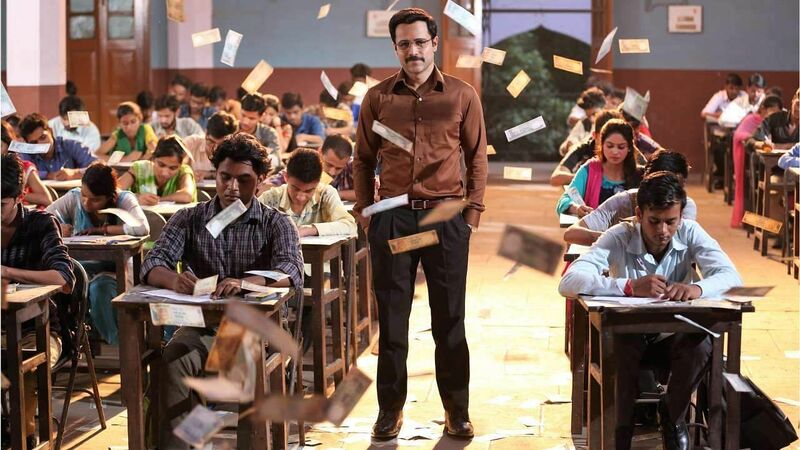 Regardless of the cautionary tone, this film about the corrupt education system in India remains staunchly committed to the smugness of its anti-hero, bespectacled scamster Rakesh Singh, as he skims off a few fast bucks and remains remorseless till the very end. (I wonder if the CBFC’s decision to mess with the film’s title was a direct reaction to this attitude, an old institution punishing its dependents for attempted ambiguity, rather like the schools and coaching centres satirised in the film). Emraan plays Rakesh 'Rocky' Singh with an inscrutable blankness. He announces his rebellion against the system — the holy trinity of the ‘Medical-Engineering-Management’ rat-race — but also dresses up like a direct product of it. He thumbs through an assortment of old Nokia phones (this is a period film, sort of) and smiles with a slightly-delayed motor response, as though reminded of an SMS joke mid-thought. In his pocket he carries a pouch of prasad from various local temples, which he offers to the parents sitting across from him. And then he lays out his plan. Bollywood debutant Shreya Dhawanthary plays Sattu’s elder sister and Emraan’s romantic interest; she shines in some of the early scenes — especially when scrunching her nose to parental sexism, or when someone gifts her a sewing-machine. Director Soumik Sen packs too many tracks into the narrative, more than he is able to handle. We shift unevenly from fast-paced montages — set in classrooms and colleges — to unnecessary songs and wedding scenes that add little to anything. Too often, a line or remark sticks out for its odd humour: a father mispronouncing ‘Johns Hopkins’, for example, or a junior employee being nicknamed ‘PPT Usha’. The noisy digital cinematography lends some rawness to the small-town milieu, but ultimately cheapens the production value when the drama shifts to Mumbai. Why Cheat India is a neatly-observed film that needed more tonal clarity to be taken seriously. It features a refreshingly amoral protagonist, portrayed by a talented male lead — but the faux-thriller-like posturings of what is essentially a dark social satire give him little room to play with. The social-messaging is bleak and pessimistic, which is great as a change for Hindi cinema, and ironically, it serves as the only bright spot in an otherwise drab and predictable storyline.